Last night, I had the honor of attending the reading and signing of The Art of Blissful Parenting, by colleague Sharon Ballantine of Ballantine Parenting Institute, at Ravenna Third Place Books. Any parent-type figure out there knows that raising kids, while it can be cute and fun, is an experience with more than its fair share of moments that are anything other than cute and fun, so of course, I had to find out what this was all about for our journey as we grandparent a 7 year old! Sharon teaches parents how to help their kids discover and navigate their own IGS or Internal Guidance System. With her calm, very kind demeanor, I can see why parents seek her out as a parenting coach and why she is the perfect person to have authored this book. Sharon says when using their IGS, kids discover the results of taking action in-alignment and non-alignment with their IGS, where the premise “think before you act” is better described as “Feel before you act.” They learn the answers are in your heart where love can help you get what you want and need vs. reactive action-taking. I am now the proud owner of a signed copy of The Art of Blissful Parenting and look forward to learning more. Thank you Sharon! 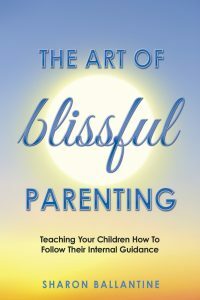 To learn more about Sharon’s book and her parent coaching practice, check out her website: SharonBallantine.com. You can catch future reads and signings at these upcoming dates, as well as receive a free video from her parenting course when you visit her website!